If you've been following me on Facebook and Instagram, then you already know about The Leak. If you haven't, then let me enlighten you. The Leak started about a month ago. At least that's when we noticed it. I was pretty positive that the sound of running water in the wall and a newly heated bathroom floor were not good signs. Then we started losing hot water. Our house is built on a slab. This means that there is no crawl space at all. Any work to fix a busted pipe in the floor requires pulling up the flooring and pulling out a jackhammer. Fun stuff, right? The first plumber we called in wouldn't get back with us. He came and looked around but then never showed up or called. By this time we had been without hot water for a week and we were just a few weeks before baby's due date. Thankfully, my Brother-in-law knows people who know people. Oh, the joys of having a family member in construction! The new plumber showed up and got to work on Wednesday. These are a few of the photos from my Instagram feed. That little door in the corner of the kitchen with the plastic over it is our only first floor bathroom. They put a hole in the floor and then in the wall but didn't find the leak until they went back to the floor and made a bigger hole. 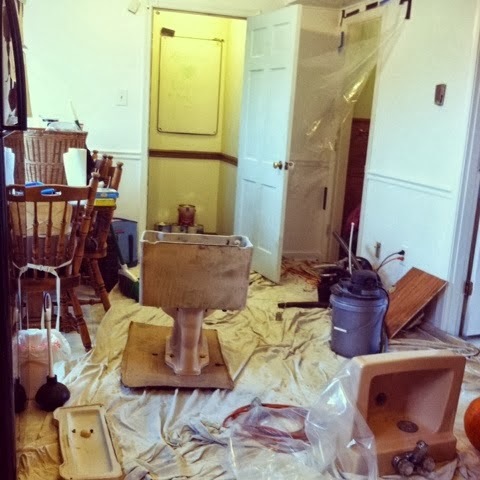 By the time they left that afternoon, we had our bathroom usable again and lots of hot water! Such a wonderful thing for this nesting mama! This floor is where we are today. Guess what this means?! New floors y'all! Woot woot! And they have to fix the wall too, which means that dated paneling is doomed! If something like this ever happens in your house, check with your insurance to see if they will cover any of the repair work. 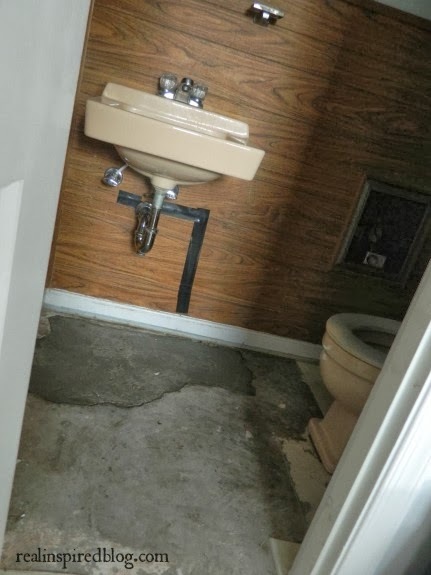 We rent from Hubby's parents, and their insurance wouldn't pay for the actual plumbing repair, but they are paying for a good amount of the floor and wall repair. 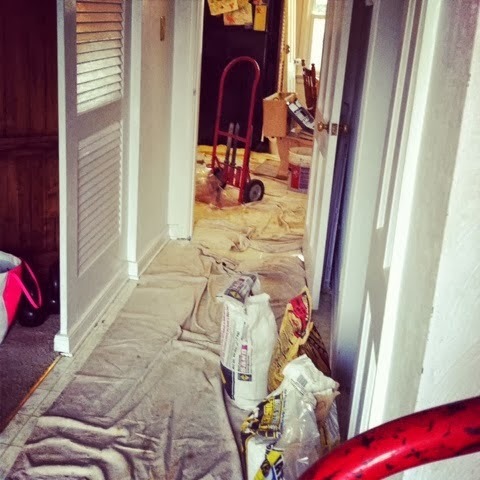 Which means, because of The Leak, they are ripping up the three layers of old linoleum and putting in all new vinyl flooring in the bathroom, kitchen, entry, and in the garage apartment bathroom that backs up to ours(the heat from the leak made the floor bubble up in there). And they are doing all they can to try and get it all in ASAP before baby arrives. Double awesomeness. Who knew a great big Leak could cause so much happiness? So after a month of water gushing under our house and two weeks without hot water, we are getting all new floors downstairs and removing the paneling in the half bath. 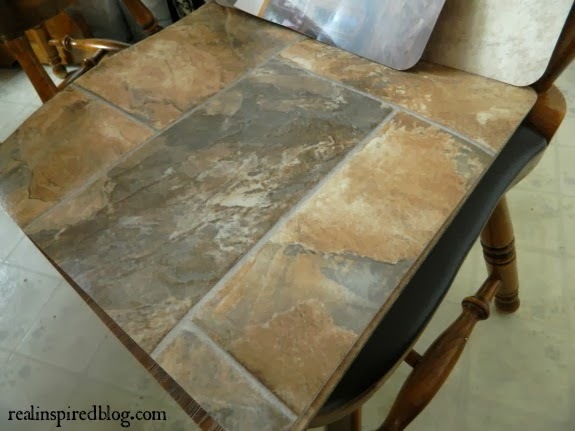 We had all of a night and a morning to decide on the new flooring and this is where we ended up. It blends all right with the kitchen cabinets and, more importantly(as cabinets can be painted), it blends with the wooden floors upstairs. For when we decide to rip out the carpet. And all dirt will be hidden. So...flooring choice. What do you think? Yay or nay? Any shared experience with busted hot water pipes?